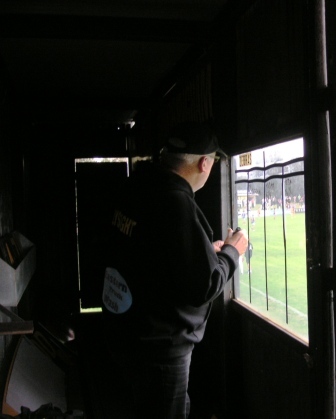 There are two scoreboards at the Trevor Barker Beach Oval: John looks after the main scoreboard, on the Beach Road wing, while camera-shy Doug Gardner tends to the boundary fence scoreboard on the opposite wing, between the interchange benches. John, 57, has been a Sandy man all his life, growing up just a street away from the ground. 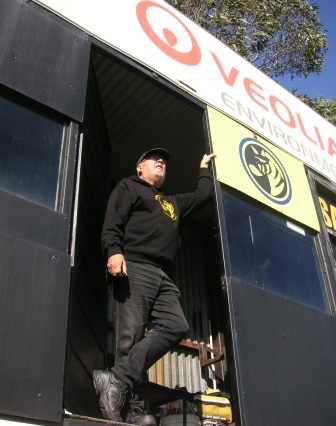 “I could hear the siren from my place.” Doug started following Sandringham in the 1980s when a friend’s grandson started playing for the Zebras. John’s first official stint on scoreboard duty was back in 1972. Doug started hanging up the numbers by the ever-busy interchange benches five years ago. From 1972 to 1985 John and his mate David O’Brien were the official scoreboard attendants. John said his first official game was against Port Melbourne when VFL stars Ron Barassi and Bob Skilton were playing for the Borough. “There were 15,000 people here. It’s hard to imagine now. Then there was torrential rain at half-time and just about everyone left.” John and his mate David got drenched, standing on the platform of the open-air scoreboard, which was at the northern end of the ground. Because he can’t see the numbers once he closes the gates, John also marks the score with a texta on the perspex window. He puts a dot under each number to signify he’s seen the umpires wave their flags. The system works well. Since returning to the scoreboard in 2008 he’s only made two mistakes. 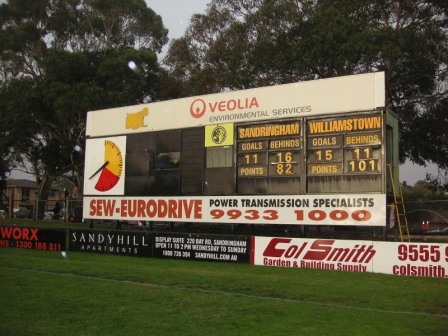 The Sandy scoreboard is from the same mould as Geelong West’s scoreboard and the now demolished scoreboards at Oakleigh and Williamstown. 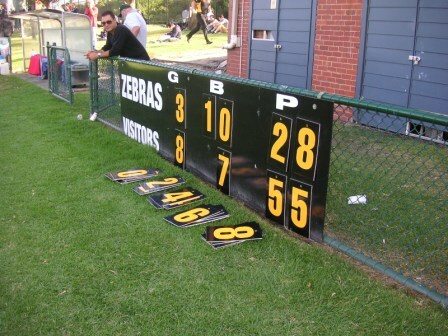 “Our scoreboard was designed by a Sandy player, Neil Evans. He might have had a game or two with Essendon,” noted John, while watching the Zebras make a stirring final quarter comeback against Williamstown. Kicking to the southern, or Nick Saunter, end, the Zebras had the wind behind their backs as they tried to rein in a five-goal deficit. 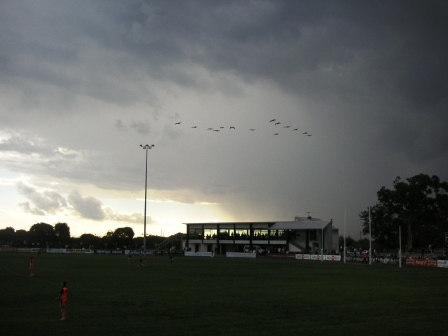 But from the north a storm was coming and when the Zebras got to within a point, the rain came down, the Seagulls cleared and goaled from the centre a few times and the game was over. John Lysaght is a regular contributor, as ‘Zebraman’, to the VFL footy forum. Lovely piece Vin. Love John’s passion and commitment, have been a VFLfooty poster for some time and he certainly loves his Zebs. 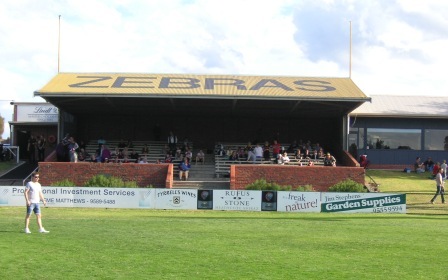 Great old ground, love that he painted the original ‘Zebras’ on the grandstand. That’s iconic…at least to me and my world. How you going to go with a laptop and sitting in the grandstand this year? This is a great piece on a dedicated Zebra. 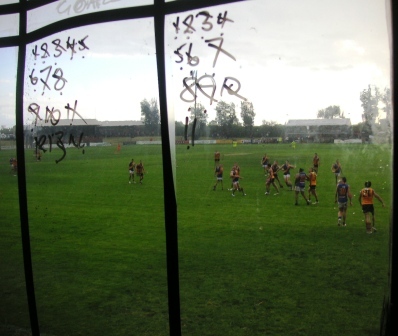 I follow John on Flickr and his photos of the footy at Sandringham. 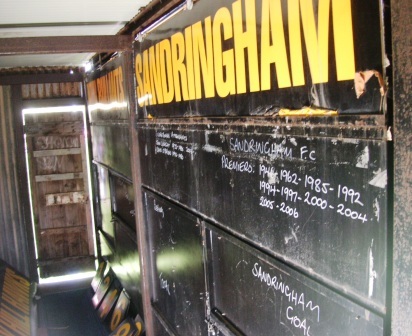 Things have changed at Sandringham since I did the scoreboard with my mate Bobbie and an older official in 1961! Good to hear from you John. Glad you like the piece. You’re most welcome to tell us a little more about your own scoreboard experiences at Sandringham. Close games, wet days, funny moments.. The sign was done by former President the late Ian Mac Kenzie and a few helpers a few years earlier.